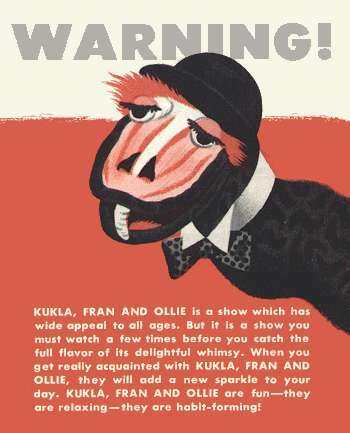 How did a puppet show created for children become "appointment television" for millions of adults? And how was it possible to go on the air for a half-hour each day and create a sharp, witty program with no script? The answer can be given in two words: Burr Tillstrom. 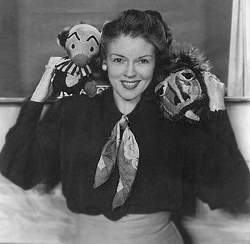 Burr was the creator of "Kukla, Fran and Ollie," and the only puppeteer on the show, which first ran from 1947 to 1957. Today, it's hard to imagine a simple puppet show being so popular, but KFO evoked not only loyalty but also a deep belief in its characters from anyone who watched more than a few episodes. 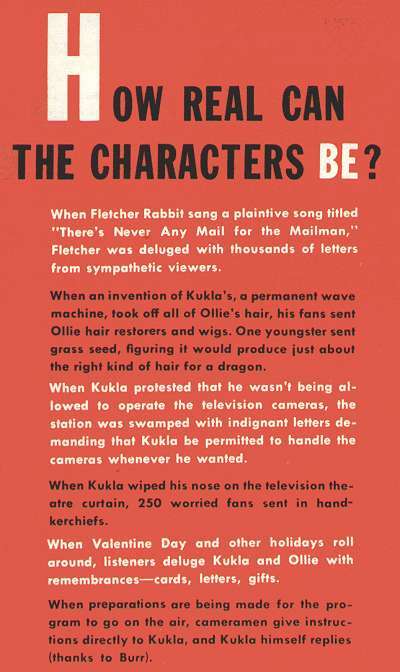 Here are a few examples from a 1949 KFO booklet: For those who know the show well, it's hard not to see Kukla, Ollie, Buelah, Fletcher and the other Kuklapolitans as anything but real people. Sure, they're made of cloth, but once one gets beyond that minor glitch, they become as real as anyone on television today. But what of the show itself? Does it hold up years later, or was it just a product of a simpler time when audiences demanded less of television? It's true that those who watch a single episode of KFO can find it difficult to grasp its appeal. But like Jack Benny's radio program, KFO's humor relied on building a relationship between its characters and the audience over time. Jumping into the middle of a series of shows doesn't allow KFO to weave its spell: Once one got to know the cast and their idiosyncrasies, it was hard not to become a fan - even though the humor was quite tame by today's standards. There were few laugh-out-loud jokes per show - unlike "The Muppet Show" (whose scripts followed today's practice of aiming for several laughs per page), KFO relied on the humor of familiarity, much like "The Honeymooners." We know Ralph Kramden is going to say, "Bang! Zoom! To the moon, Alice!" but we still laugh when it happens. Watching KFO was like inviting good friends into your home - you had to know them before you looked forward to their visit. KFO fans became so attached to the show that when it was cut back to 15 minutes, letters of outrage poured in to NBC and The New York Times. Bob & Ray, who had the unfortunate job of rounding-out the half-hour, had considerable vitriol heaped on them by angry KFO viewers. Once one understands the cast, KFO episodes remain surprisingly fresh today. It's still fun to watch Kukla threaten to quit for the umpteenth time, to see Fletcher throw another fit when he can't control every last detail, or to watch Madame Ooglepuss attempt once again to stage an operetta with the hopelessly inept troupe. The few tapes that are available for viewing reveal a show filled with references to the theater, opera, current events and other topics one would never expect from a children's show. 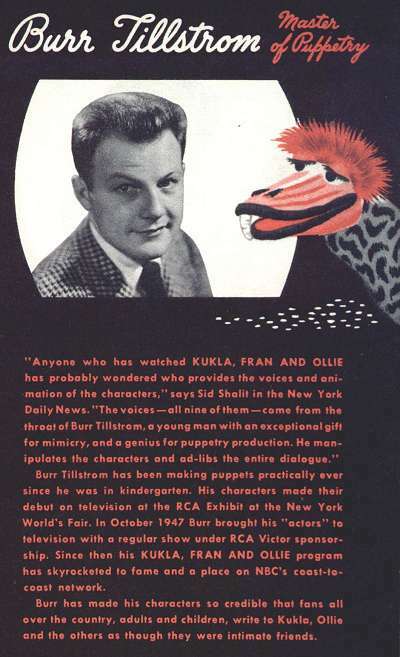 After the original series ended in 1957, Burr continued to search for a place for the Kuklapolitans, doing a daily 5-minute show for NBC, and even appearing on Broadway. In 1967, KFO began hosting "The CBS Children's Film Festival," and it is through this show and their later series for PBS, that many of us know the troupe. But these later shows pale in comparison to Burr's work in the '50s. This is confusing, since when Burr performed live at the Goodman Theatre in Chicago in the early 80s, he was at his improvisational best. Perhaps Burr needed the excitement of a live audience to get his creative juices flowing. Whether performing before a theater audience or on a live television show, it seems Burr responded well to that kind of pressure, as opposed to the taped shows of the '60s and '70s. 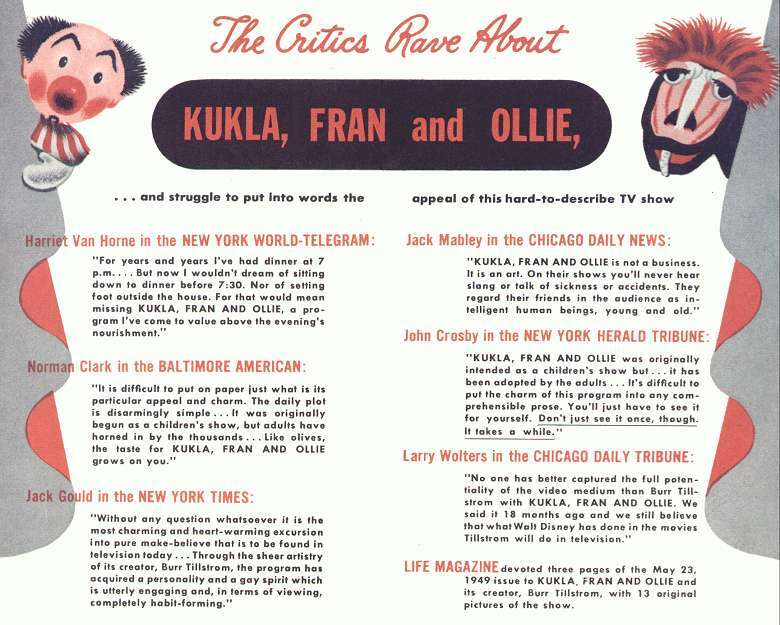 "Kukla, Fran and Ollie" has not remained in the public consciousness with the same potency as "Howdy Doody," but even a cursory comparison of films of the two shows reveals that this is due less to KFO's quality than to Burr's adamant refusal to market the show and do the kind of merchandising that made Howdy so ubiquitous. There were no Kukla dolls or puppets, and few toys of any kind, since Burr couldn't bear to see rows of his "kids" lining toy store shelves. Over 700 films of the show from the 50s remain in existence, and 20 of the early kinescopes have been released on DVD. The best way to reclaim KFO's place in television history would be for the series to be run, in sequence, on cable. Of course, since the existing films of the show are black-and-white kinescopes, this is highly unlikely, but if true "narrowcasting" ever becomes a reality (perhaps over high-speed internet connections), people will be able to appreciate the genius of a man who recognized the power of television long before there was such a thing as a network or even much of an an audience.